This mosaic was assembled from pictures taken by the Curiosity rover's navigation camera over several days (in black and white) as well as its Mastcam 34 camera (in color, with contrast enhanced to bring out detail). Gaps in the Martian sky have been filled based on the shading in existing imagery. Over the past few days, we've been tracking the assembly of a giant jigsaw puzzle from Mars, delivered piece by piece by NASA's Curiosity rover. Today, image-processing wizards are adding more of the key pieces to fill out the picture of the 3-mile-high mountain that the car-sized rover is facing. Newly available full-color pieces of the puzzle show the mountain, known as Aeolis Mons or Mount Sharp, as seen by Curiosity's Mastcam imaging system. Previous versions of the Martian panorama have been in black and white, or "colorized." What we're seeing now are Mount Sharp's true colors, tinged in the red dust of Mars. In the image above, Ken Kremer, a New Jersey-based journalist, Ph.D research chemist and photographer, fits the color imagery inside a bigger black-and-white jigsaw puzzle that's been provided by the rover's navigation camera system. (We featured the Navcam panorama a couple of days ago, and a couple of puzzle pieces have been added since then.) The color contrast has been bumped up to bring out more of the detail on the mountaintop. If you were to see the scene with the rover's eyes, the shades of color would be much more muted, due to the lighting conditions and the presence of dust in the Martian air. In the image below, British educator-astronomer Stuart Atkinson's presentation of the puzzle pieces closer to the "true" colors. 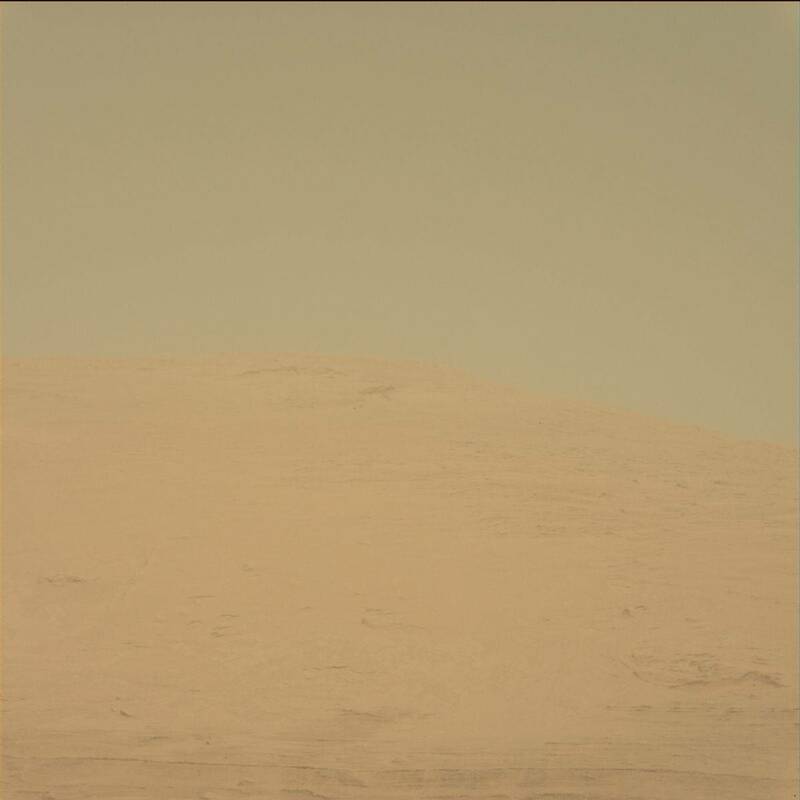 This true-color view shows the Mastcam view of Mount Sharp's peak in color. The colors are more muted than they would be on Earth, due to lighting conditions. An enhanced-color version of stitched-together Mastcam imagery provides a closer look at the mesas and buttes on the flanks of Mount Sharp. These images provide just a taste of the view captured by the Curiosity: Each of the frames that make up the Mastcam mosaic measures 1,200 by 1,200 pixels, and as you can see in this sample frame, each full-size puzzle piece shows rock layering that you can't possibly make out in the larger overall puzzle pictures. The geologists and planetary scientists who are working on the $2.5 billion Curiosity mission will be poring over pictures like this for months to come, in order to plot the six-wheeled rover's route up the mountainside. Eventually, Curiosity will be snapping full-color pictures at much closer range, and perhaps even capturing video of its exploits at 5 frames per second. But even now, the Mastcam views are giving Mars fans plenty to ooh and ahh over — whether they're members of the Curiosity team at NASA's Jet Propulsion Laboratory, or watchful wizards of image processing from across the globe. To get in on the wizardry, click on over to UnmannedSpaceflight.com, where folks such as Kremer and Atkinson regularly hang out. (Some of the forum's habitues already have filled in even more pieces of the puzzle.) For more about what Kremer's up to, check out KenKremer.com or the Adirondack Public Observatory's website. And to check in with Atkinson's activities, click on over to The Gale Gazette or The Road to Endeavour. Watch the rover fall to Mars ... in HD!